With Deng inbounding the ball, the rest of the Bulls form a diamond, with Kyle Korver at the top of the key, Rose in the paint, Taj Gibson at the weak-side elbow, and Joakim Noah at the strong-side elbow. 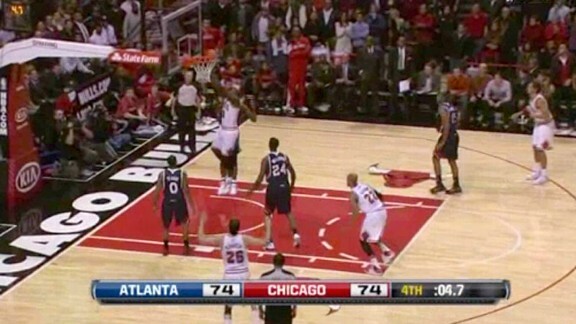 As soon as Deng catches the ball, Rose sets a back screen for Kyle Korver. Korver uses the screen and then fades to the corner. After screening for Korver, Rose comes off another screen, this one set by Noah. Noah simply turns around at the elbow on and Rose curls around him and heads toward the corner. 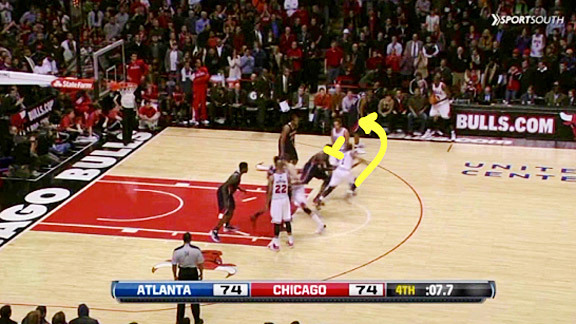 Once Rose uses the screen, Noah turns to the ball and makes himself available for the inbounds pass. After throwing to Noah, Deng cuts toward the baseline. Meanwhile, Rose runs to the basketball, looking for a quick handoff. The threat of Rose receiving the handoff draws the attention of Atlanta’s two strong-side defenders. Josh Smith, who was guarding Rose, stays with him. 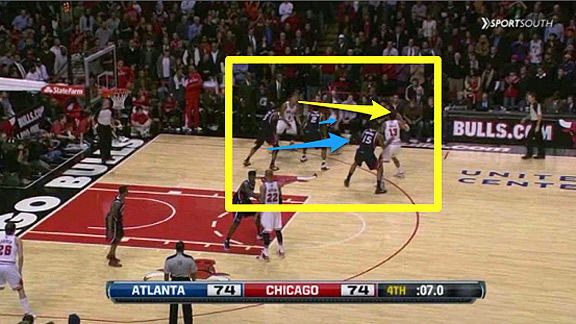 More importantly, the possible handoff attracts the attention of Joe Johnson, who was guarding Deng. This frees Deng for a backdoor cut. Before we get to the game-winning shot, let’s look at the Bulls’ weak-side activity. Despite not being a threat to catch the ball, Marvin Williams is guarding Gibson tightly at the elbow. At first glance, it’s hard to understand why Williams defends Gibson so closely. A closer look, however, reveals that the play design keeps Williams attached to Gibson. With Gibson at the elbow and Korver in the opposite corner, the two are in perfect position to execute a pin-down screen if Rose receives the handoff. 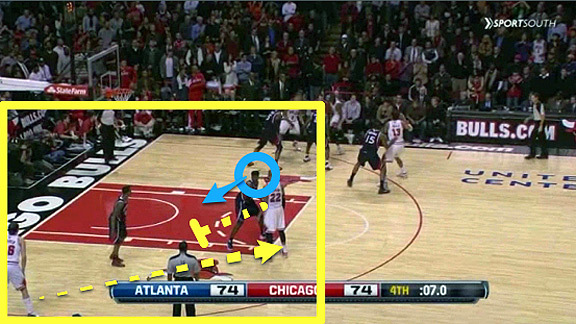 The Bulls know the pin-down will never take place, or that it will only happen if Deng can’t get open, but the Hawks don’t know that. 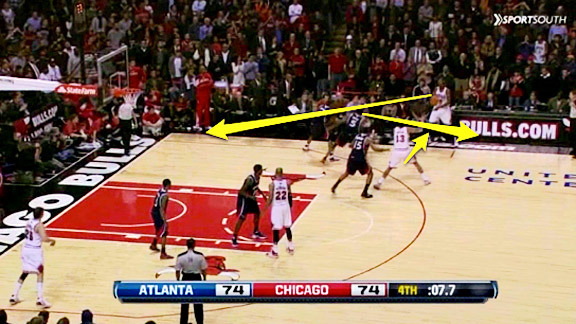 They can’t leave Korver or Gibson because if that pin down gets executed the Bulls will have an open look. Returning to the strong side, Johnson tries to recover after losing Deng but he can’t get there in time. After focusing on Korver and the decoy pin down, Williams finally turns to see the basketball. Williams is still tight on Gibson, but with the pass on its way to Deng, Williams should be moving down to contest Deng’s shot at the rim. Williams doesn’t get there fast enough — or at all — and Deng makes the catch and finishes quickly at the rim, giving the Bulls a 2-point lead. This is a fantastic misdirection play from the Bulls. Atlanta’s defenders expected Rose to get the handoff, take the ball to the top of the key, and try to isolate his man. Instead, Rose drew the attention of the defense while Deng cut to the rim. This play is gorgeous on many levels. First, the set up on the weak side occupied Atlanta’s help defenders and prevented them from being in proper help position. 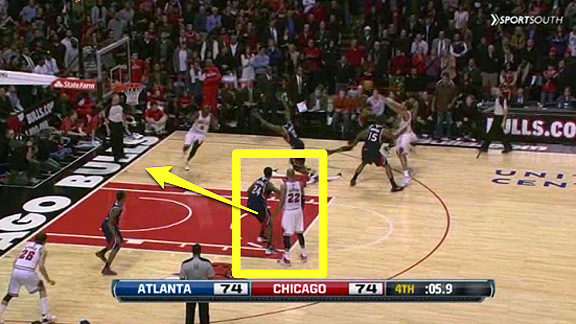 Even more clever is the fact that if Deng doesn’t get open, the play isn’t dead. 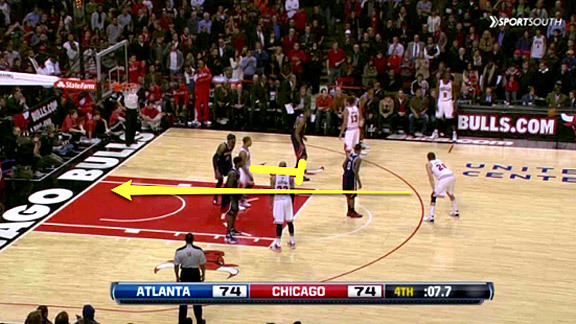 The Bulls still have Rose looking for the handoff, and if that isn’t there, then the pin down becomes an option. Noah, after receiving the inbounds pass, isn’t going to be stuck with the basketball as the clock runs down. Most head coaches of teams that have superstars don’t run set plays down the stretch. They worry that by running their best player off the basketball, he might not get it back and the team won’t get a decent look at the basket. This is why Kobe Bryant gets the ball in isolation on so many last-second possessions. With this play, Thibodeau drew up a set that could get the Bulls a quick-hitting shot, and if that wasn’t there, they could still get the ball to their best player. That’s pretty impressive.